This is the Jewish Historical Marker, donated to the City of Glendale by the Jewish American Society for Historic Preservation. Glendale Oregon is a quaint little town that sits five miles west of Interstate 5. The population in the city limits is 875. The expansion of the Oregon and California railroad to the south in 1882 helped the growth of Glendale. Lorenzo D Montgomery, a settler of 1880, sold land to the railroad which eventually became the town. Solomon Abraham later bought the land and platted the town, which he called Julia, after his wife. 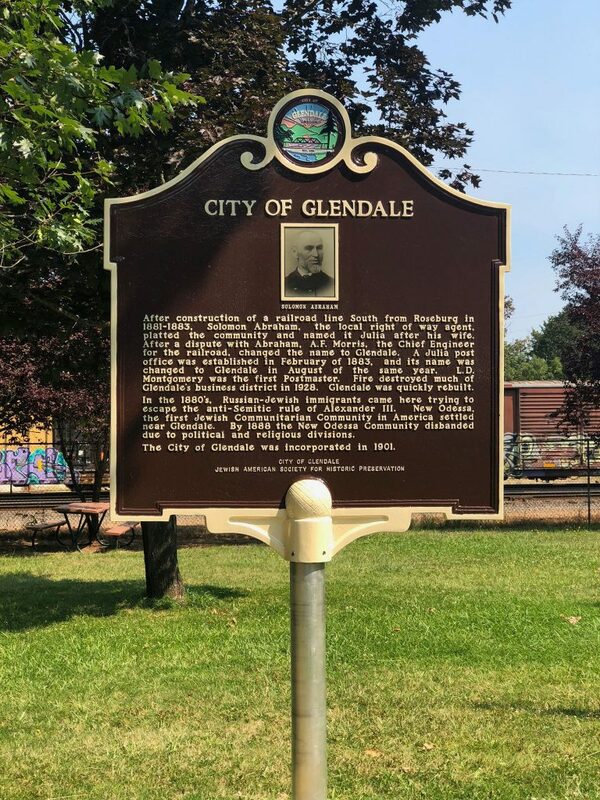 The railroad made Glendale a boom town, bringing in railroad workers, Chinese immigrants, loggers, and workers for newly built sawmills. However, as the railroad pushed on to Grants Pass, the railroad workers moved on, too. But Solomon Abraham continued to encourage development. He built stores, saloons, livery stables, and hotels in Glendale in the 1880’s. The town incorporated in 1901. By 1929 Glendale was the site of 11 sawmills.